A second Leptotes species is opening this morning. We grow the two species of leptotes close together in Warm Americas and both mounted. 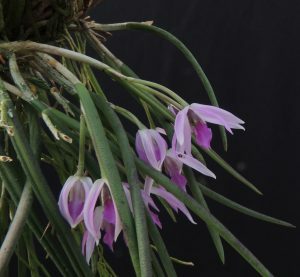 Leptotes pohlitinocoi is more pendulous than Leptotes bicolor and is determined to grow downwards which can make display a little difficult. This plant has been on this mount for about twelve years showing the slow rate at which it grows.